The first round of the DFB Cup is here and those two Bundesliga sides are in action tonight to kick off their seasons. For the rest, it's only a matter of hours before the first competitive game of the 2015/16 campaign, and just a week before the Bundesliga gets back into business. As always, bundesliga.com will keep you updated on all the activity around the Bundesliga clubs as the summer break draws to a close. That brings an end to our live updates service for today. Join us again tomorrow for your daily fill of Bundesliga goodness, with plenty more DFB Cup action on the cards, including the likes of FC Schalke 04 and Bayer 04 Leverkusen. Well done to Darmstadt 98 and Augsburg anyway. The first competitive outing of the season is never easy. Gute Nacht! Hats off to Elversberg, but it's the Bundesliga's very own FC Augsburg who go into the pot for the second round - 3-1 after extra time. Two more substitutes combine as Tobias Werner tees up Sascha Mölders, who puts Augsburg ahead for the first time! 1-1 after 90 minutes, but Elversberg had a man sent off towards the end of the second half so it's advantage FC Augsburg, or is it...? FC Augsburg substitute Raul Bobadilla grabs a late equaliser - at last! Newly promoted Bundesliga side SV Darmstadt 98 march into the second round of the DFB Cup courtesy of a dominant 5-0 win over Regionalliga West representatives TuS Erndtebrück, the goals coming from Dominik-Stroh Engel (2), Marco Sailer, Marcel Heller and Konstantin Rausch. Midway through the first half and it's time for a drinks break in Erndtebrück, where SV Darmstadt lead 2-0 in the first round of the DFB Cup. 35°C at this time! FC Schalke 04 have announced they will contest the Florida Cup along with Bayer 04 Leverkusen and Brazilian clubs Corinthians and Fluminense in January. The SV Darmstadt 98 players are out getting a feel for the pitch at TuS Erndtebrück. That one kicks off in just over an hour's time. "Every game in the Cup is a final," says Hamburger SV head coach Bruno Labbadia ahead of Sunday's trip to FC Carl Zeiss Jena. VfB Stuttgart new boy Emiliano Insua is looking forward to his first slice of the DFB Cup pie against a Holstein Kiel side that missed out on promotion to Bundesliga 2 in the play-offs last term. Peru international defender Carlos Zambrano has inked a new deal at Eintracht Frankfurt. The 26-year-old has spent his entire professional club career in Germany, joining the Eagles from FC Schalke 04 in 2012. FC Schalke 04 will be desperate to avoid the ignominy of being knocked out of the first round of the DFB Cup by lower league oppositon when they take on MSV Duisburg tomorrow. The Royal Blues fell at the first hurdle against SG Dynamo Dresden last summer. DFB Cup holders VfL Wolfsburg are on their way to Baden-Württemberg for tomorrow's first-round clash with third-tier outfit Stuttgarter Kickers. With Bastian Schweinsteiger no longer at the club, FC Bayern sporting director Matthias Sammer has confirmed that Manuel Neuer is now vice-captain, followed by Thomas Müller. Peniel Mlapa has joined Bundesliga 2 side VfL Bochum 1848 following three years at Gladbach. 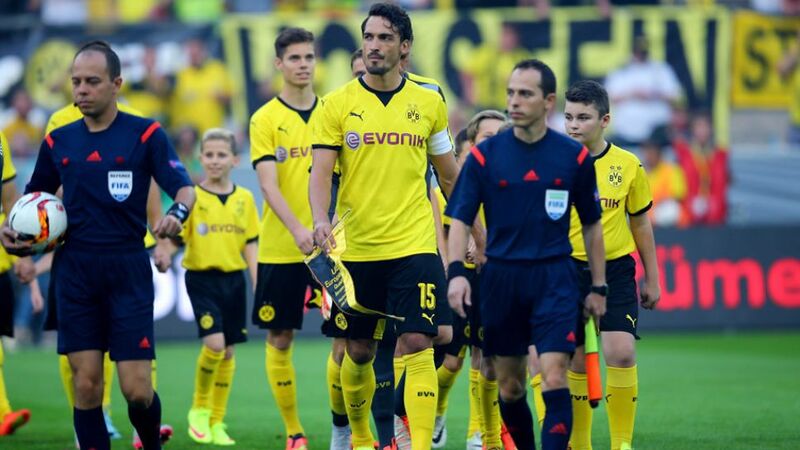 Dortmund and Odd are both looking forward to some exemplary hospitality during their Europa League play-off tie. Gladbach summarise their week's training in a YouTube video. After getting the boots clean and shiny, it was off to the railway station to catch a train to the first round of the DFB-Cup at Würzburg! Bayern's sporting director Matthias Sammer gave coach Pep Guardiola a breather at a press conference on Friday, answering the media's questions instead of the Catalan. Odd being the name of the Norwegian club, not the draw in itself! Bayer 04 Leverkusen will face SS Lazio in the play-off for the UEFA Champions League. 'Is it a good draw?' asks this Tweet from Die Werkself. The mercury could reach the 40-degree mark on Friday in some parts of Germany, but that has not put Arjen Robben off from putting in an extra shift to boost his fitness. Clubs are out and about starting the first important trips of the new season, with the DFB Cup looming large. Coming up from lunchtime, Bayer 04 Leverkusen and Borussia Dortmund will discover what hurdles they must cross to reach the group stage of the UEFA Champions League and UEFA Europa League respectively.